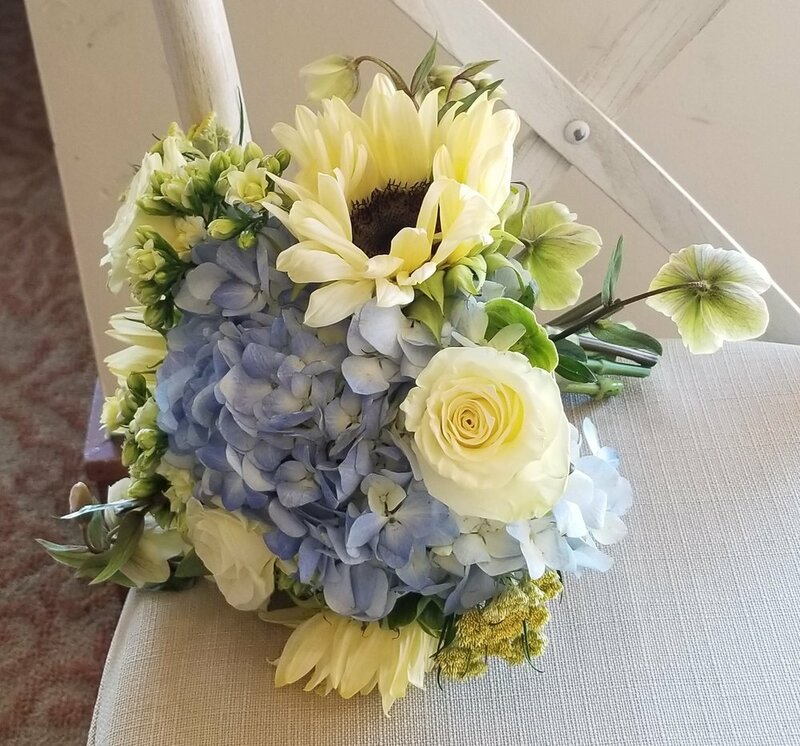 Learn about hiring Hydrangea Bleu to design your wedding flowers. A spring hand-tied bouquet in yellow, green, and white. A modern take on yellow, green, and white - the composite bouquet designed with cymbidium orchids. The softer side of yellow, blue, green, and white. A charming spring hand-tied bouquet. Weddings. How can you not smile at the idea of getting married! You've found the one person to take the journey of life with and now you're ready to mark the beginning with your wedding! 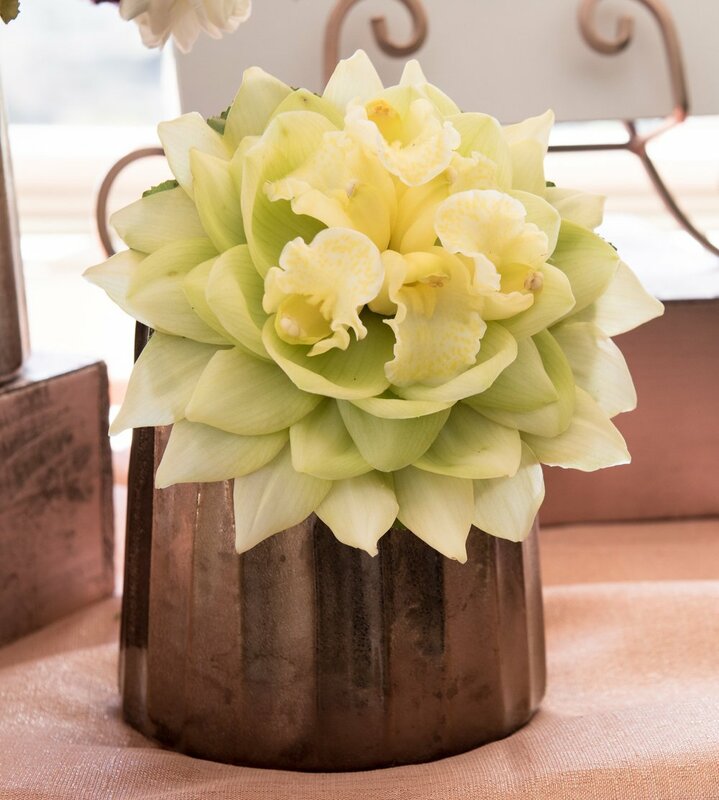 One of the many decisions you will make in planning your wedding will involve your flowers. You've come to the right place! Have you dreamed of an all white wedding lush with peonies and pieris japonica? Maybe you've always wanted a backyard wedding - simple, casual, comfortable - you're in love with the simplicity of tulips - lots & lots of tulips. How about something a little different.....you prefer the clean, contemporary look that mini calla lilies embody. So, where do you start? Before you decide on which flowers, you need to determine which colors. Look to your venue to start with. To create a cohesive setting, take a look at the colors of the venue. Take cues from the carpet & wall coverings; the gardens, if the ceremony/reception will be held outside. Think about colors that will complement the existing colors. Once you've determined colors, then, for the most economical choices, find out what flowers are in season in your colors. We can help with sorting out your options. We'll guide you through the process of making the best choices given your style, your budget, your likes, your dislikes. We'll help you set the tone for your wedding so that it reflects your personality and preferences. Contact us to get started. We'd love to chat with you!